You guys know how excited I was by the Leixen VV-808 mobile... I am on a quest for a simple, inexpensive mobile. I keep thinking if the Chinese can make good, cheap HTs that a mobile should be easy to do as well. The Shouao TS-688 came across my radar and I thought maybe this is the one. It is even dual-band. That all sounded pretty good. Then I got a reply from the supplier saying that the cost for a single unit was $176 USD. I don't even know if that includes shipping. At that price, it didn't matter. So what am I missing? Why is it so hard for someone to make a cheap mobile? Or am I the only one interested in them, so there really isn't demand to go down this path? Just a Baojie BJ-UV55 with another sticker. Low price though. The problem is the dealers cut, they get hold of the price "Double" it, add Tax or VAT @ 20% which is the case in the UK, and finally shipping charges. Then the price for something that starts out at below 60 Dollars from the factory becomes Hundreds which just makes it look totally silly. The dealer would argue he has to pay his staff, keep the lights on and make a profit. I would say if you halfed your price you would sell more? @ Steve: US taxes aren't as insane as in the EU. A 2-way radio with a value below $200 (price + shipping + insurance) is free of duty. (dutycalculator.com). Above that amount you pay 4.4%. Apart from that I still advise people to buy a Yaesu FT-7900. The cheapest A-brand around, and excellent in ever respect. Yes, pricier than any Chinese radio, but worth it. I agree the Japs still lead the way with flawless performance and Quality Control, at the moment, I have the previous model the FT-7800, but soon the Chinese will be up to speed and thats not too long away now? The Yaesu FT-7900 sells for over twice as much ($366) as this on Amazon, and has no 220 MHz. If you do APRS or packet, then the Yaesu is the clear choice. Personally, that doesn't matter to me. As I see it, this whole controversy over A-brand vs. Chinese brand comes down to longevity. The A-brands are more reliably built and will last 20 - 30 years. But who knows what ham radio will be like in 20 years? In my opinion, it will be dead or some other (currently unknown) technology will supplant the FM repeater scheme. 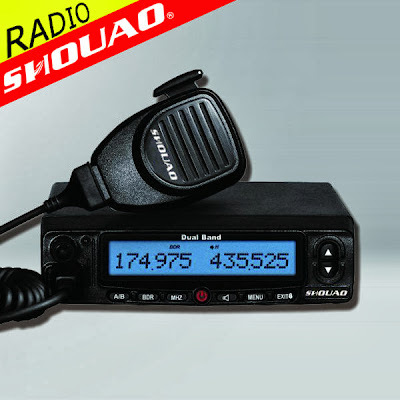 I'm looking at the Shouao as a base unit with much higher power than my Baofeng. It's more important to get more people on the air with cheap radios than it is to get a few people on the air with radios that will last the remainder of their lifetimes. If there's no one to talk to, your radio is useless, no matter how well-made it is. I would never have become a ham if I had to drop nearly $400 on a radio. There are too many other interests competing for my money. But a $50 BaoFeng wasn't a big gamble, and I got my licence. It's *a hobby*, after all. It's not as if I need a radio for my job or to save my life. Either way, you have a much better chance of "upselling" a Yaesu to someone who's already "in" than you do to making an initial sale to someone who's "out". Now, 220 MHz is pretty much dead, but you get the option to play with it on the Shouao. Hell, I live in a major metropolitan area in the U.S. and *UHF* is pretty much dead. Still, I like my toys to have options. So I'm not as ready to dismiss this as others are.